ARTBA member CASE Construction Equipment May 18 said it would provide $25,000 in equipment support to one deserving village, town, municipality or county to go towards the construction or repair of infrastructure in the community. 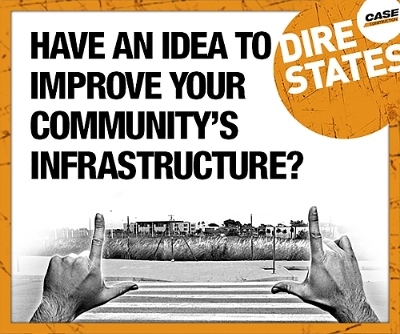 Launched during Infrastructure Week’s Advocacy Day on Capitol Hill, the grant is named for CASE’s infrastructure awareness and advocacy initiative, Dire States, which evolved from a national tour in 2013 that focused on raising awareness of America’s ailing infrastructure into active campaigning for specific programs and legislation. The deadline for entry is Aug. 1, and winners will be announced in September. Entrants will be asked to describe the project and provide a detailed assessment of how that local piece of infrastructure will benefit the community. All local governments in the U.S. are eligible to apply. A full list of rules and submission criteria are available at www.direstates.com/grant/ or at www.direstates.com and www.CaseCE.com. CASE and its Dire States campaign are leaders in ARTBA’s Transportation Investment Advocacy Center™ (TIAC) and its “Transportation Investment Advocates Council”, a national network of more than 60 business professionals and public officials sharing intelligence and “best practices”—campaign strategies, tactics, messaging, opinion and economic research, legislative and ballot language, “what’s worked and what hasn’t”—in order to help state and local transportation advocates meet their objectives.